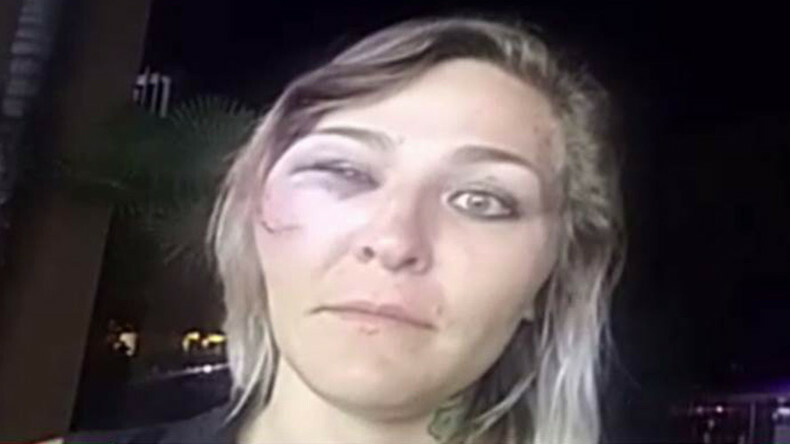 As Thursday’s protest in California ended with police firing pepper balls at demonstrators, RT talked to a witness who says it was a beanbag used by law enforcers which caused the large bruise on her face. Next time, she will not be just a bystander, Richelle Washabaugh said. Protests have been ongoing in El Cajon, San Diego County, since Wednesday, after it emerged that a police officer fatally shot 38-year-old Alfred Olango, an unarmed black man with an apparent history of mental health problems. On Thursday night, police used pepper balls on another small rally and detained two men, after the crowd started throwing glass bottles at the officers. RT spoke with Richelle Washabaugh, a woman who was in the area on Thursday night. Richelle says she and her friends had no part in the protests, but nevertheless were set upon by police officers. Richelle was hit by a so-called ‘bean bag’, a police baton round considered less harmful than rubber bullets but that can still cause damage. RT:Richelle, so what happened to you in the protest? Richelle Washabaugh: We were just innocent bystanders standing outside a 7/11. All the military police started coming towards us, started shooting at us, started throwing tear gas, starting throwing these little bean bag things which is what hit me in the face. It was crazy. We were just standing there doing nothing, minding our own business. RT:What caused the protest to turn violent then, in the words of the police? RW: Honestly, none of the protests were even going on when this happened to us, everyone had kind of given up and it died down, and we were just standing outside a 7/11, you know, just being bystanders, and they all started going after us. And they started shooting and they started spraying. RT:How did the police react when you were there? Was there already something happening at the time you were there, or were you there initially when the police arrived? RW: No, the police had already been there when we had showed up, the police had been there for a while. I was just minding my own business, and they came up on me and all my friends and shot me in the face for no reason. — RT America (@RT_America) 30 сентября 2016 г.
RT:Were your friends OK? Did anyone else get injured in the unrest? RW: My friend got teargassed straight in the face and started vomiting. There were paintballs, this beanbag stuff hit me in the face… yeah, it was a madhouse. RT:Was there a warning from the police that you may be fired on if you didn’t move? RW: Nope, no warning. They warned the protesters, who we were not with tonight at all by any means. The protesters went their separate ways. We were just standing outside of the 7/11, minding our own business, kind of watching things, and this is what happened. 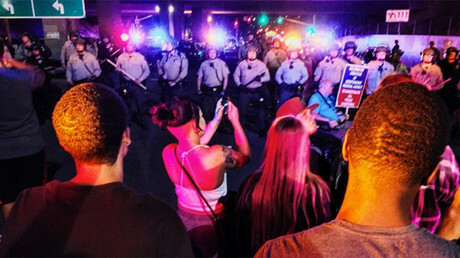 RT:There have been three nights of protests in El Cajon over the police killing of an unarmed black man. Why do you think such incidents keep on happening? RW: Because our justice system is messed up. Our justice system is so corrupt. Police can’t be trusted, the D.A.s can’t be trusted, nobody can be trusted. RT:Does it look in El Cajon that the protests are going to continue? It’s the third night already, so do you think it’s going to happen some more? RW: Yes, Saturday and tomorrow night are going to be crazy. But tonight, we didn’t take any part in the protests and this is what happens. RT:And what do you think can be done to stop this, so that this wouldn’t be repeated? RW: The police can stop being a**holes who shoot at innocent people? Just saying, you know! I mean, I was an innocent person tonight who got shot for standing there. RT:Is that going to stop you from going out and protesting, your injury? RW: It’s not. If anything, it has fueled the blood inside of me. I’m going to go out there on Saturday, and I’m going to show the cops what’s up! RT: And do you believe a lot of people are thinking the same as you? RW: Yes, I hope so. Because we’re fed up, all of us are. This is happening everywhere, all over the world. And we’re sick of it. We’re fed up.